Originally, Interstate 185 was commissioned as a short spur extending from northbound Interstate 85 to Mills Avenue (U.S. 29) at Dunean, just outside the Greenville city limits. The route was eventually extended south and east along the privately-operated Southern Connector through south Greenville County and Mauldin. The Greenville freeway spur opened initially as the new alignment of U.S. 29, with the old route redesignated as South Carolina 20. U.S. 29 historically also combined with U.S. 25 along Augusta Road to Main Street. Interstate 185 encircles southern areas of the Greenville area between Mauldin and Lakeside along the tolled Southern Connector. 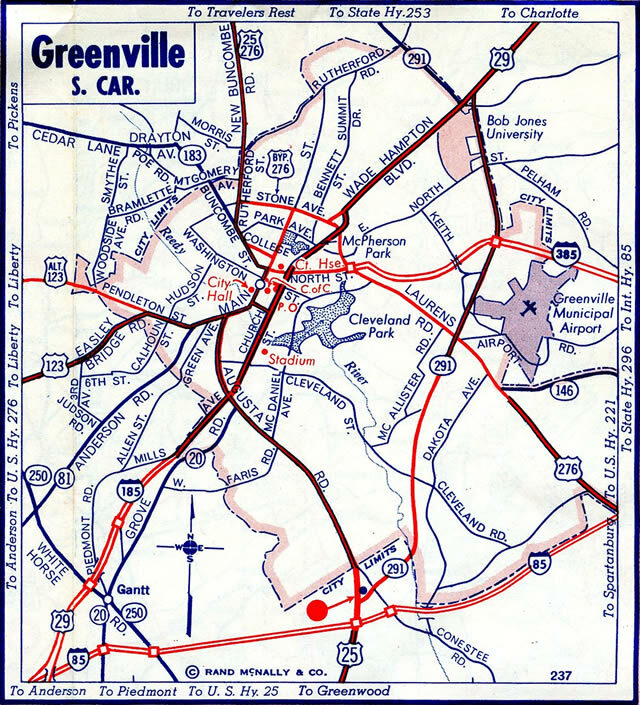 The original freeway spur provides access to Downtown Greenville from the southwest. 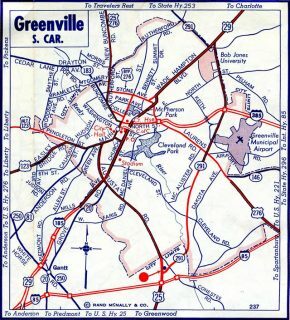 Church Street was extended southward to Interstate 185 during the 1950s when the freeway spur was constructed.2 Per the 1957 USGS Topo map of Greenville, the freeway was constructed initially as a new alignment of U.S. 29, with U.S. 29 Bypass routed along what would later become Interstate 85. The wye interchange at the south end of I-85 was expanded by February 1999 to include full access between the two freeways. The AASHTO Route Numbering subcommittee approved the extension of Interstate 185 from Interstate 85 southeast to Interstate 385 at Mauldin on December 9, 2000. The route was initially designated a future route until the Federal Highway Administration gave approval. Completion of the route took place on February 27, 2001, with the entire Southern Connector opened to traffic. Tolls commenced operations on March 12, 2001 with $1.50 charged for passenger vehicles traveling the entire length of the route. While owned by the state, the toll road was privately financed through the bond market and was operated by the Connector 2000 Association, Inc.8 Exits numbers along the original I-185 spur to Greenville were renumbered from 1 and 2 to 15 and 16 respectively. A freeway ends regulatory sign precedes the West Faris Road underpass along Interstate 185 & U.S. 29 northbound. The final northbound on-ramp adds traffic from adjacent South Carolina 20 (Grove Road). Photo taken by Carter Buchanan (01/13/16). Milepost 16 appears as Interstate 185 transitions into a four-lane urban boulevard (Mills Avenue) at Henrydale Avenue. U.S. 29 proceeds north along Mills Avenue and Church Street 2.6 miles to North Street in Downtown Greenville. Photo taken by Carter Buchanan (01/13/16). Mills Avenue (U.S. 29) transitions into Interstate 185 adjacent to a shopping center south of Henrydale Avenue. The first reassurance marker for I-185 appears as the freeway leads southwest to Exit 16 (S.C. 20) and Exit 15 (U.S. 25). Photo taken by Carter Buchanan (01/14/16). Departing the second main line toll plaza, Interstate 185 progresses eastward toward Exit 1B with Interstate 385. This stretch remains somewhat rural though some suburban development lies nearby/ Photo taken by Carter Buchanan (01/13/16). Forthcoming Interstate 385 replaced U.S. 276 along the freeway leading southeast from Mauldin to Simpsonville, Fountain Inn and Clinton. The freeway ends to the north at Downtown Greenville. Photo taken by Carter Buchanan (01/13/16). Construction of the interchange between Interstates 185, 385 and U.S. 276 resulted in the relocation of Neely Ferry Road. The road circumvents the exchange to the west, while providing local connections from U.S. 276 and to East Standing Springs Road. Exit 1B quickly follows Exit 1A for I-385 south toward Columbia. Photo taken by Carter Buchanan (01/13/16). Exit 1B departs from below the Neely Ferry Road overpass for I-385 south to Simpsonville. The Southern Connector extends east another 1.8 miles to ramps with S.C. 417 and I-385 north. Photo taken by Carter Buchanan (01/13/16). An end sign for I-185 follows the loop ramp for S.C. 417 into Mauldin. Interstate 385 runs another six miles to I-85 and 12 miles north to Downtown Greenville. Photo taken by Chris Patriarca (04/06/03). This set of signs posted at Exit 1A for Neely Ferry Road was replaced after 2012. Photo taken by Chris Patriarca (04/06/03). The pull through panel for the Interstate 185 mainline leading to I-385 north was replaced by 2008 to include Spartanburg. Photo taken by Chris Patriarca (04/06/03). Interstate 385 north leaves the city of Simpsonville and approaches Mauldin and the split with U.S. 276 (Exit 30). U.S. 276 begins a two-state route to Cove Creek, North Carolina from I-385 while providing part of the movement to the Southern Connector (I-185) leading west. Photo taken 12/31/13. An auxiliary lane accompanies I-385 north to the U.S. 276 expressway spur into Mauldin. I-185 begins just to the east to run along side Interstate 385 to U.S. 276. Photo taken 12/31/13. Two lanes branch away from Interstate 385 north for U.S. 276 north to Main Street in Mauldin and Interstate 185 north along the Southern Connector toward Anderson. Photo taken 12/31/13. Interstate 385 encircles the east side of Mauldin on the one mile approach to Interstate 185 (Exit 31). Photo taken by Chris Patriarca (04/06/03). Turning to the southwest, I-385 splits with I-185 in one half mile at a wye interchange (Exit 31). Photo taken by Chris Patriarca (04/06/03). I-185 initially parallels I-385 west from Exit 31 to U.S. 276. The adjacent route provides access to S.C. 417 (Main Street). Interstate 385 otherwise continues southward toward Columbia via Interstate 26 in 90 miles. Photo taken by Chris Patriarca (04/06/03). The wye interchange between Interstates 85 and 185 was expanded to include full access between the two freeways. Provisions were built into the interchange for the eventual Southern Connector. Photo taken 12/08/99. Buchanan, Carter. “Southern Connector (I-185) officially opened.” Online posting, misc.transport.road, February 27, 2002. The History of Greenville, city of Greenville web site. “Planned Projects.” State, The (Columbia, SC), April 20, 1997. “Upstate Toll Road To Take Its Toll.” State, The (Columbia, SC), August 11, 1997. “State approves $17.5 million for connector.” Anderson Independent-Mail (SC), February 11, 1998. “Connector construction revs up.” Anderson Independent-Mail (SC), February 28, 1998. “S.C. Highway To Open Early, On Budget.” State, The (Columbia, SC), March 19, 2000. “Greenville connector sees brisk traffic.” Anderson Independent-Mail (SC), February 28, 2001. “Drivers decrease on toll road.” Gaffney Ledger, The (SC), January 13, 2006. “SC toll road operator files for bankruptcy.” Herald-Journal (Spartanburg, SC), June 24, 2010. “Tolls rise on Southern Connector near Greenville.” Associated Press State Wire: South Carolina (SC), January 3, 2012. Page updated January 25, 2016.